If Apple does start trial production in the next three months, it should help advance the launch dates for the phones, sources with Taiwanese IC (integrated circuit) design firms told DigiTimes. Trial production occurs on a small scale, intended to work out any yield problems before mass production. Prior to the iPhone X's launch, multiple reports indicated that suppliers were having trouble manufacturing the phone's 3D-sensing TrueDepth camera. Specifically the issue was said to be the camera's dot projector, then nicknamed "Romeo." The dot projector is perhaps the most vital part of the camera, casting over 30,000 invisible dots on a person's face in order to generate a depth map. Misalignment or failure of the dots can throw off results. Apple is believed to be working on three new iPhone's for this fall, all of them equipped with TrueDepth. 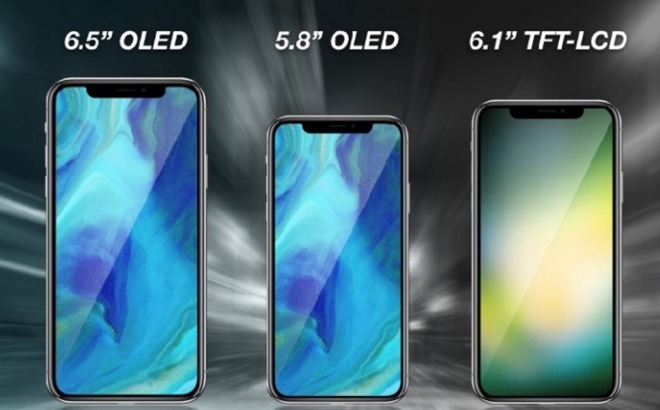 While one should use a 5.8-inch OLED display like the iPhone X, another should have a 6.5-inch OLED panel. Finally, a 6.1-inch LCD phone could provide a less costly alternative for the masses. The next devices to get TrueDepth cameras should actually be updated iPads, which could be announced at a March 27 press event.